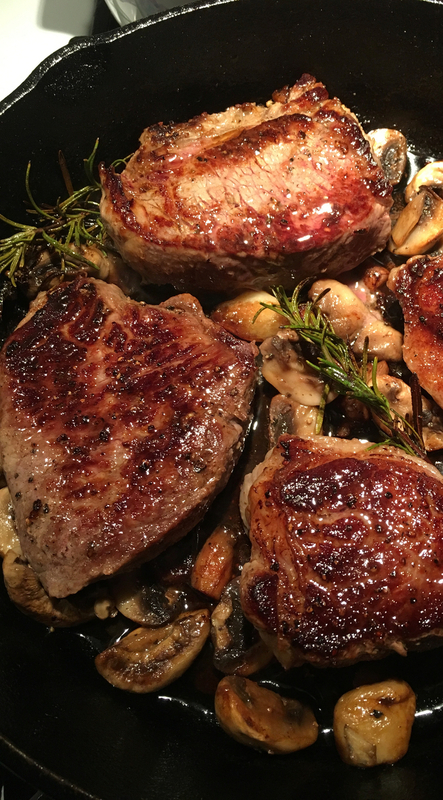 After 2 weeks of being out sick, here is my first attempt to give you this recipe for Petit Sirloin Steaks with Mushrooms. It was really hard to be creative when your brain is not working. Luckily today I feel better and more confident to power on. And I was craving for something hearty and robust after 2 weeks of eating light soup. Most steaks are way too big for one person and that’s why I love sirloin steaks. The cuts are just enough size and because of that, it cooks faster. When it comes to steak, I believe in salt and pepper to keep the natural flavor of the beef. But then when you add garlic, rosemary, butter and mushroom, the result is juicy meat with that magical flavor. Ahhhhh….., life is good! A side dish of baked potato or mashed potatoes, asparagus or green beans will go well with these steaks. Oh, and you might also like to have a crusty bread to soak up the pan drippings. Preheat oven to 375 ºF. Preheat large cast-iron pan on medium/high heat. Add 1 Tbsp olive oil to pan. Use a paper towel and pat dry steaks. Season sirloin steaks with a little salt and freshly ground pepper, then sear on one side for 2-3 minutes to form brown crust. Flip it over and cook for another 2 mins. Transfer steaks in pan into the oven and roast for 5-6 minutes (for medium doneness). Take it out of the oven and transfer pan on stove top at medium heat. Add butter, garlic, and rosemary into the pan. Let cook for 2 minutes, while basting the meat with pan juices. Flip the meat one more time. Add mushrooms in between the steaks and let cook fo 1-2 minutes. 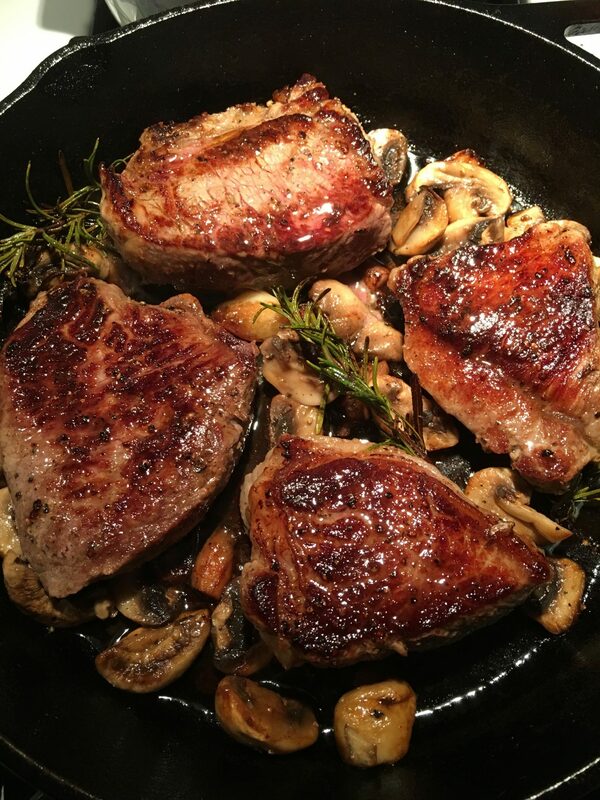 Serve steaks immediately with pan juices and mushrooms. Adjust cooking time to preferred meat doneness.